Game of Thrones star Lena Headey listens to a question during an interview with the Associated Press in Athens, June 1, 2016. “Game Of Thrones” stars Lena Headey and Iain Glen are taking a break from swords and intrigue to tackle a real-world crisis in their latest venture: a low-budget, independent film on Europe's refugees. Both appear as immigration officers in “The Flood,” which follows the journey of an Eritrean migrant trying to reach Britain. “You know what's happening in the world, globally is horrific. And, you know, for it to be dealt in cinematic form, I think is a great thing to do,” said Headey, best known for her depiction of the twisted matriarch Cersei Lannister in the TV series. Glen plays exiled knight Ser Jorah Mormont on the HBO series. 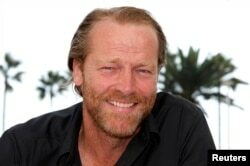 Actor Iain Glen poses while promoting the television series "Jack Taylor" in Cannes, France, October 3, 2011. The film's title is a reference to the often pejorative language used to describe the arrival of large numbers of migrants in Europe. The film's producer Luke Healy said he bypassed the usual funding channels and managed to get financial support from a prospective buyer he was showing round his apartment. “She didn't end up buying the flat — but she bought the movie. She was our sole investor,” he told Reuters.